Sunday lunch was at The Cadogan Arms, a gastropub which is owned by the ETM Group who also own other well known gastropubs such as The Well, The Gun, The White Swan and The Botanist, etc. The Cadogan Arms closed for extensive refurbishment in December 2008 and reopened for business in April this year. Although I have had some good meals at the various ETM establishments in prior years, my last outing was a far less positive experience. We were at The Botanist last year (pre-blog) when we were served bread that was still frozen. This was probably a one off, but I just got the feeling that on that particular occasion the food was not going to be good and that we would be better served to simply abort our mission and leave before our mains. We didn’t get good bread at The Cadogan Arms either. Our sourdough bread was dry and tasted a little stale. 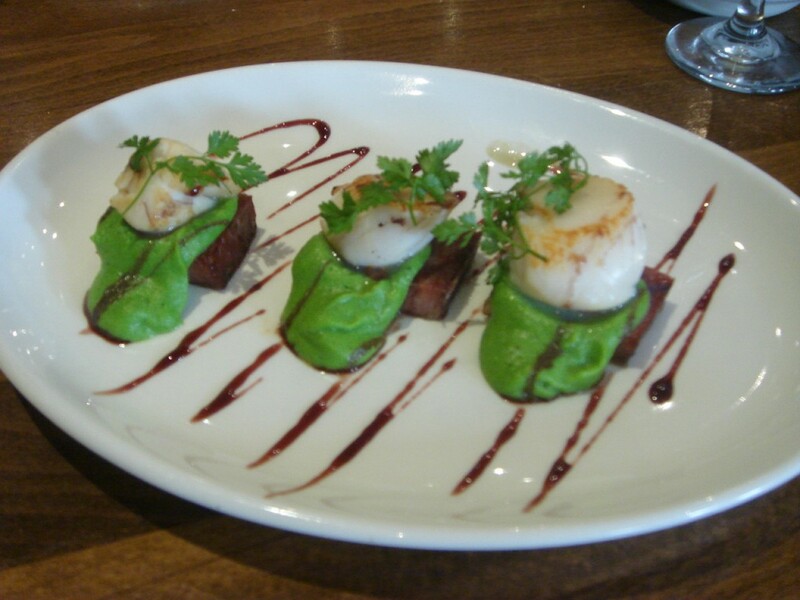 A starter of seared scallops with smoked pork belly and pea puree (£9.50) was also disappointing for the scallops were rubbery and bland. Unevenly sized to the point where one piece was about double the size of the other two, this bigger piece surprisingly released a noticeable amount of liquid when I sliced into it, as if it might have been cooked from frozen and was still defrosting on my plate. The pea puree was tasty, although the smoked pork belly wasn’t particularly smoky. The presentation of the dish was also poor for some of the balsamic dressing had smudged on the plate. This dish was unappetitising and I was unable to finish it. 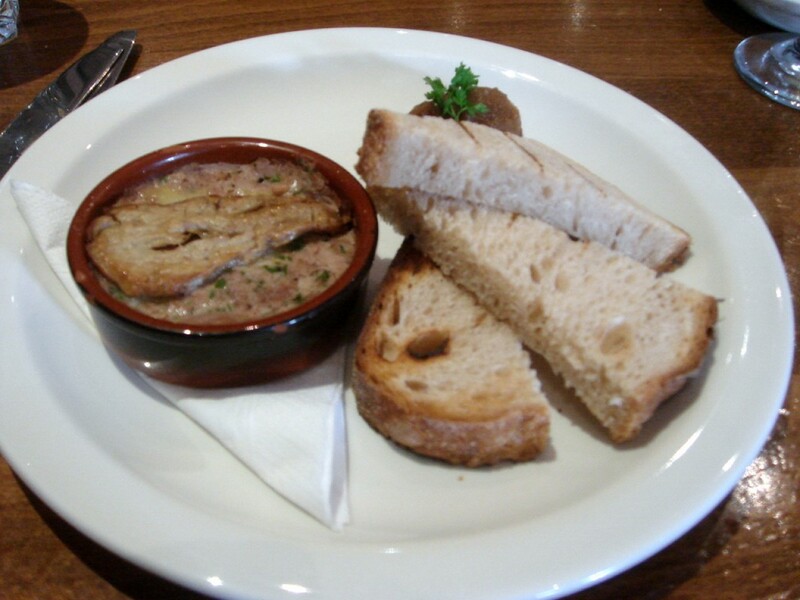 Another starter of foie gras and duck rillette with toasted sourdough, pear and apple chutney (£6.50) was also disappointing. Served cold, the rillette was quite hard and did not have the creamy melt-in-your-mouth texture that a good rillette usually possesses. The foie gras perched on top also looked dried and shrivelled. 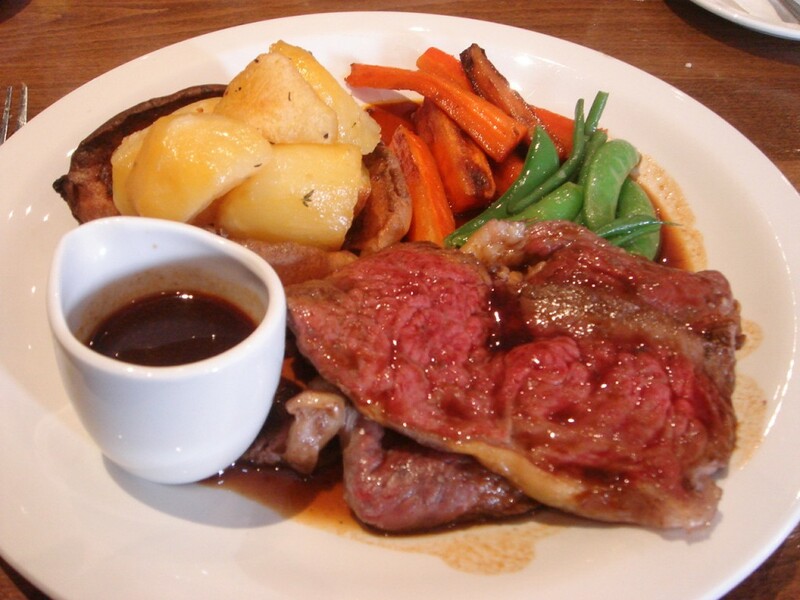 Being Sunday lunch, we both settled for the roasts – British beef and free range Devonshire chicken (both £14.95). The beef was tasty, although only one of my two pieces came out as the requested medium rare with the other piece being well done. The accompanying red wine gravy was excellent and the sides of beans and carrots were nicely cooked with a little bite. However, the Yorkshire pudding was a little too doughy, and the roast potatoes had obviously been precooked and left to sit for a while as they were not particularly crispy. We had a late sitting though, so presumably the potatoes would have been better had we started eating at noon. 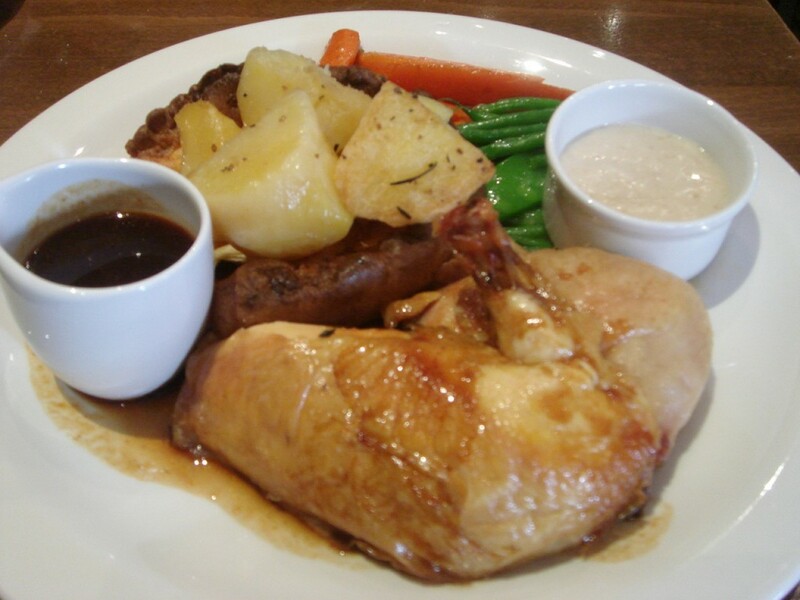 The roast chicken was also nicely done and came with bread sauce, roast potatoes, seasonal vegetables and jus. Desserts were excellent. A champagne jelly with strawberries, vanilla ice cream and home made shortbread (£5) worked really well together, and a valrhona chocolate tart with espresso ice cream was delectable. The ice cream, which cut the richness of the tart nicely, was perched over a buttery biscuit and added a further depth to the dessert. This was a mixed meal. There was a carelessness in the preparation and presentation of the starters which was quite off putting and made me doubt the quality standards of the kitchen. The roasts were reasonably tasty, although there were aspects in both of them which could have been a little better. As far as ‘Sunday roasts’ go, this is not a gastropub I would make a special trip for – it’s more of a ‘if you happen to be in the neighbourhood and feel like a roast’ type place. However, the desserts were very good, and at £5 were very reasonably priced. 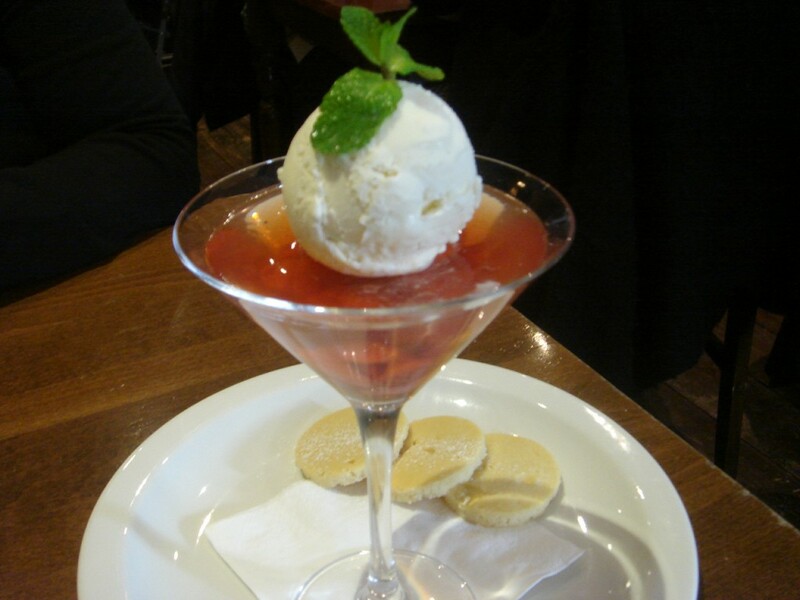 The waiting staff were quite friendly and warm, and so this helped the overall experience. 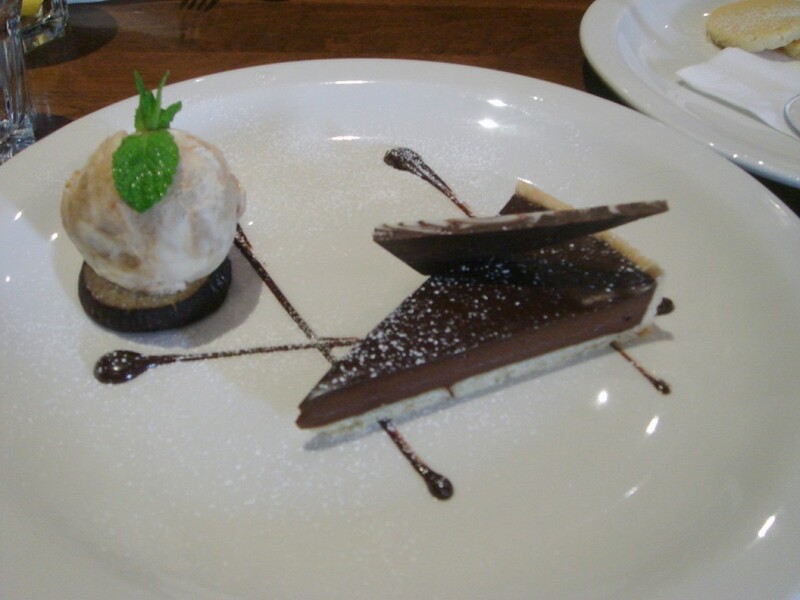 But despite this and the fabulous desserts, I am not sure that The Cadagon Arms is a place I would rush back to again. 3 courses from £21 to £32 – excludes drinks and service. A very uneven experience here I guess. The desserts look great though!